Buoyed by a surprise investment from Britain, the European Space Agency secured approval from its member states on Wednesday to develop a service module for NASA's Orion deep space exploration vehicle, giving the continent a stake in human missions beyond low Earth orbit. The initial investment, worth $320 million over the next two years, will start development of a propulsion and power module for the Orion multipurpose crew vehicle, or MPCV. Britain, which has eschewed contributing to the space station in the past, put the proposal over the top with a pledge to pay 20 million euros, or about $25 million, for the service module. Jean-Jacques Dordain, ESA's director general, said the development could help a European astronaut secure a spot on Orion crews bound for deep space, the moon, or asteroids. The European-built service module will contain fuel tanks, provide propulsion, and hold Orion's solar panels to generate electricity. NASA plans to provide a maneuvering engine to mount on the service module. In a meeting of government ministers in Italy on Tuesday and Wednesday, ESA's member states haggled over the agency's budget, eventually settling on 10 billion euros, or $13 billion, in spending from ESA's 20 member states over the next few years. 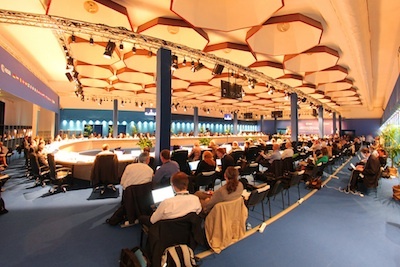 Top agenda items included decisions on a future European launcher and the extension of Europe's involvement in the International Space Station. Governments agreed to upgrade Europe's existing Ariane 5 launcher and put off a decision on a replacement rocket until mid-2014. And officials came to a consensus to continue ESA's support of the space station until 2020, a pivotal decision which hinged on the Orion service module. 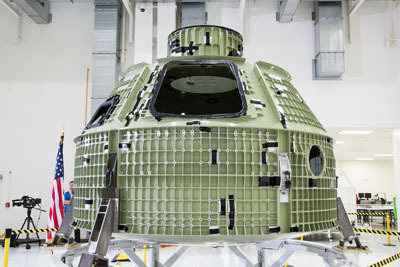 The first flight of a full-up Orion capsule is scheduled for launch in late 2017. The unmanned mission will launch on NASA's Space Launch System, a heavy-lifting rocket being developed to facilitate missions beyond Earth orbit. The flight plan calls for the 16.5-foot-diameter capsule to fly around the moon and return to Earth on a voyage lasting more than one week. "The first flight is to go to the moon," Dordain said. "And we can say we will be part of the first flight of the MPCV by delivering the service module. Construction of the service module for the 2017 mission will pay back NASA for Europe's share of the space station's operating costs. The space station partners prefer supplying a "barter element" to reimburse NASA for the costs rather than paying in cash. Europe's barter element for the station's operating costs through 2017 is the Automated Transfer Vehicle, a resupply freighter designed to haul propellant, air, food, water, spare parts and experiments to the outpost once per year. ESA is discontinuing the ATV program after the fifth vehicle, which is expected to launch in 2014. The end of the ATV program leaves Europe owing NASA for operating expenses from 2017 until 2020, which is as far as the space station partners have agreed to operate the orbiting lab. The funding shortfall from 2017 until 2020 is about 450 million euros, or $580 million. Europe and NASA have a preliminary agreement for ESA to build the Orion service module for the 2017 test flight, but European governments were required to approve the measure this week. A formal agreement between ESA and NASA could be signed in the next few months. "This is the first time ESA is contributing to a crew transfer vehicle," Dordain said Wednesday. "This is certainly a breakthrough." The U.S.-based Orion prime contractor, Lockheed Martin Corp., has sidelined development of a U.S. service module to focus on construction and testing of the crew capsule, which is designed to carry four people. The next time European government ministers meet in 2014, they will be asked to spend at least another $260 million on the service module program to see it through to flight in 2017. France fought the German-backed proposal for the Orion service module, arguing it did not advance European technological development because it is similar to the service module used by the ATV. The Orion service module, like the ATV propulsion section, will likely be manufactured by EADS Astrium in Bremen, Germany. Germany is Europe's largest space station backer, committing $690 million to the program over the next several years. An unmanned test flight of a prototype Orion vehicle is due for launch in September 2014 on a United Launch Alliance Delta 4-Heavy rocket, but it will not include a functional service module. The capsule will be sent into a high-altitude 3,600-mile-high orbit around Earth and then return back into the atmosphere, reaching speeds simulating a re-entry from a deep space mission to stress the capsule's heat shield. 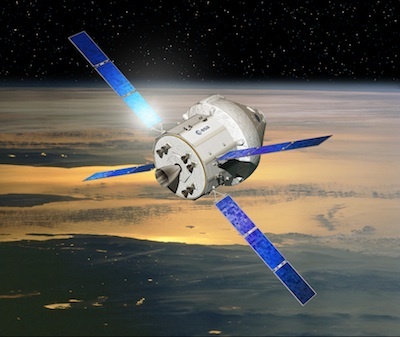 Johann-Dietrich Woerner, chairman of the German Aerospace Center, said there is only an agreement with NASA for one Orion service module so far. "From our point of view, we would like to have this as the basis for future cooperation with the USA," Woerner said in an interview. "So far, we will build everything for the service module for the maiden flight in Europe, and then we will discuss future joint activities in that field. Right now, the target is the maiden flight of Orion to the moon." Germany's overall ESA subscription - totaling $3.3 billion - makes it the largest contributor to the space agency. France agreed to spend $3 billion on ESA programs. The UK eclipsed Italy to become the third-largest ESA member state, promising $1.9 billion. Italy pledged almost $1.5 billion. The commitments are mostly spread over the next two-to-four years, depending on which programs each country is backing. Britain's investment in the space station is part of a $100 million increase in space spending over the next five years. The British contribution to the Orion service module will include work on telecommunications and propulsion systems, according to the UK government. "I will speak English because this is the price I have to pay for the UK to be on-board the ISS," Dordain joked in a press briefing. He later called the British decision an "historic event" for Europe.